[Ottawa – July 26, 2013] Consider the long term future from the perspective of the average Canadian. The short term outlook doesn’t look that bad. Fears of job loss are much lower than in the nervous nineties. The economy may have been basically stagnant since the September 11th attacks, but hey, we aren’t Spain, let alone Greece. But this might be the end of the good news. The same mythical average Canadian has experienced essentially zero real growth in income or standard of living since the beginning of the new century. Whatever meagre profits are being generated by our sluggish economy are increasingly appropriated by a narrow cadre of the über wealthy. Erstwhile third world economies are now part of the ascendant new global order and Canada continues to slide from top to middling economic performer. It appears that the basic charter of liberal capitalism is unravelling. The American and Canadian dream of a better future – assured for families through hard worked hard and ingenuity – no longer seems assured. For the first time, more Canadians feel they are worse off than their parents. This gloomy picture about current progress turns depressingly dark when we are asked to chart the prospects of the next generation. Less than 15 per cent of us think the next generation will be better off (almost exactly the same slim number as we see in the US public). The “average” Canadian is also much less likely to locate themselves in the “middle class’ which has fallen below half in terms of self-definition. Vertical social mobility is no longer upward; it’s downward as the diminished middle class falls backward into the working class or the poor. So while it may not be too bad, nothing in the future looks all that positive for the average Canadian. Faith in the hyper power status of the United States, and that entire celebratory triumphal end of history stuff has been displaced with a precipitous decline in confidence in the United States, upper North America, and even the Western world. The burgeoning, optimistic middle classes who signal progress and prosperity are no longer denizens of North America; they live in Southeast Asia and other “BRIC” countries. After declaring the death of state socialism and the triumph of capitalism, it is the new ‘red capitalism’ fusion which is the locus of global economic progress. Our relatively smaller cohort of younger citizens is opting out of democracy and faith in public institutions. A sclerotic gerontocracy is charting a path through the status quo – which shows no signs of arresting the slow slide from the top of the economic heap to middling status. Perhaps most cruelly of all, the devil’s trade off of more inequality, lower tax rates for the wealthy and corporations and a minimal state isn’t producing the promised trickle down benefits. Monetarism, and the bumper sticker simplicity of “lower taxes + less government = prosperity for all” has been laid bare as a cruel hoax. And the myth that inequality might be tough medicine – but that it provides a springboard for greater social mobility and economic efficiency – has also been punctured. It is now vividly clear that those places with the greatest level of inequality (which is rising throughout the advanced western world) are the places with the lowest levels of upward mobility. The Gatsby Curve shows that it is the US that now has the greatest levels of intergenerational reproduction of wealth and social order (along with the UK). Canada is moving with similar rapidity towards a more unequal society. If you want to see where opportunity expresses itself best, where the most able rise to the top, don’t go to the United States or even Canada. If you want to live the American dream, move to Denmark, which incidentally is one of, if not the top performing, Western economies in term of standard of living. These sentiments are admittedly an exaggerated depiction of the darkness of the future. We have enormous strengths and there is no reason whatsoever that we should be content with being number 17 in the world in standard of living with a downward bullet on the international charts. Yet there is little beyond the gloomy diagnostics about the age of stagnation and even decline that suggests a path forward. Sentiments can become a self-fulfilling prophecy and the window for reigniting a sense of progress and an expansionary inclusive middle class is closing. This is the challenge of our time. So lacking a handy prescription I thought it would be useful to turn to the same public who have become so bleak and put a simple set of choices to them. Which of the following broad trajectory choices would be best to set us on the path towards a more secure, prosperous and meaningful future? Without overstating the value or folly of such broad input, we think it is worthwhile to examine long term public deliberation on four fundamental choices for the future of the country. Let’s look at four basic questions we asked Canadians. These choices capture some of the most important policy debates as we look to the future. The first two questions, about immigration and trade, essentially ask whether we should be more open or closed. The third question asks whether our future is better served by exploiting our carbon energy ‘superpower’ status or by turning towards a post-carbon economy. The final choice asks whether future generations will be better served by a more or less active state. This seemingly simple set of choices likely covers a significant portion of the variable policy choices confronting Canada. In each case we can link responses to these questions to our more detailed tracking of these issues over the past couple of decades. Immigration is a very hot issue in Europe and America. In Canada, it hasn’t been a ballot booth issue ever and the debate is much more measured and temperate. While debates about immigration and multiculturalism inevitably can be emotional, the overall tone in Canada has been more calm and receptive on these topics. Greater receptivity to multiculturalism and immigration has been described in some places as the “Canadian advantage”. A more peripatetic, diverse and open society would appear to be well-poised to reap the opportunities of a more global economy. This advantage may be steeped in the original, and now obsolete, multicultural policies of the late twentieth century and immigration policies which have been open but less susceptible to the difficulties of open borders to the South in the United States and through Europe. Many of the current difficulties with immigration in Europe and America escalated in the period following the September 11th attacks. Our evidence shows that Canada also experienced a short term spike in opposition to immigration but this spike abated and returned to normal and fairly low levels. In the United States and Europe, this has not been the case. In considering whether we need to open Canada’s borders to even greater levels of immigration a number of other long-term issues need to be considered. First of all, some students of the rise of Southeast Asia (e.g., Kishore Mahbubani ) have argued that the recent success of the new tigers rests on the adoption of what are largely western economic, scientific, and cultural principles (e.g., meritocracy, free markets and private property, scientific innovation, etc.). What is unique about the success of these western principles is their fusion back into the originally economically dominant Southeast Asian societies and the sheer advantage of vastly larger populations. He argues that the middle class in China alone will approach one billion by 2020. In contrast, the relative paucity of people in Canada (even North America) may be a structural obstacle to longer term competitive position. A second consideration are the shifts driven by climate change, natural resource scarcity, and global economic integration and population movements. In this longer term outlook, Northern Rim Countries (NORCs) are an emerging superpower. The critical missing ingredient is population. So Canada has been a global success story in managing immigration and diversity, and there are sound reasons to believe that we cannot truly compete without a much larger population. The broad forces of climate change are working against the world but seem relatively much more favourable to Canada. In the long term, could Canada see itself as a country of 50 million in twenty years? How about 100 million by 2050? Could Canada position itself as the first post-racial society? An emergent superpower, which is racially blind in its relatively privileged new position in a warmer and more resource-depleted world? In fairness, this really isn’t the question we put to Canadians. Our question was much simpler and, although it focuses on the long term, it undoubtedly reflects some of the current economic anxieties that may be driving enthusiasm for immigration (and trade) downward. It is, however, notable that the current long term preference pretty clearly leans towards less and not more immigration. We suggest that this view could shift if the public were provided with a more deliberative and reflective set of questions on this topic. Yet at the present time, our long term preference is more closed than open. Does this reflect a monolithic consensus? Not at all, and when we examine the views of those groups who are growing within Canadian society, and who will actually inherit the longer term future, the case is much more evenly mixed. With a few exceptions support for a more open Canada is significantly higher amongst those groups that are growing in size, and who are more prominently part of ‘next’ Canada that will actually have more of a stake in questions about the long term future (support is higher in younger, more educated and more ethnically diverse parts of Canada). By corollary, resistance to more long term immigration is much stronger in Conservative Canada (Jason Kenney notwithstanding), older Canada, and less educated Canada. Women are also more allergic to immigration than men, part of a longstanding gender gap where women seem to favour a domestic-first approach to the economy and labour market. Another salient question in Canada is whether we should focus our economy inward or outward. In a sense, this is the economic parallel to the question of immigration. Instead of people, do we want goods and services to flow relatively unimpeded across our borders? Should commerce be severely bounded by political geography or should it be relatively unfettered? As in the case of immigration, it appears that Canadians may be turning somewhat inward and this question of whether our long term focus should be more domestic or trade centered produces a pretty clear domestic preference. At the close of the last century, Canadians had arrived at a remarkably pro-trade perspective. We had seen opposition and support essentially transposed from the beginning of the nineties and North America was working in lock step to a very pro-trade liberalisation perspective. The initial decade of the twenty-first century has seen a considerable amount of wind come out of the sails of the pro-trade consensus. But in one sense, this shouldn’t be that surprising. September 11th (or rather Sept 10th, 2001) is, in hindsight, an increasingly bleak high water mark in the open character of upper North America. Since then, we have seen not only reduced appetite for immigration, but also trade. It is particularly the case in the United States, where the exuberant internationalism that infected near unanimous support for the Iraq war and the presumptions of viral democracy, collapsed into something tantamount to neo-isolationism. It may be that history will fix this terrible date as the trigger for the end of Western global hegemony. Yet terrible as the event was, there is clearly an element of irrationality at play as well, as our human and material capital, infrastructures and more were not affected in any significant way. Sentiments and values, however, such as the ‘spirit’ of capitalism are perhaps even more important than the rational balance sheet and it is these sentiments that are at least temporarily in fragile condition. The unremitting stagnation of the economy, particularly for the middle class, has left the public suspicious of all of the ‘elite prescriptions’ for economic well-being. It may be that we would be even worse off without free trade agreements and the economic theory of the efficiencies of trade liberalisation remains persuasive. The average member of the public, however, is less persuaded and the continued relative ascendance of the BRIC nations seems to underpin more resentment than a sense of global opportunity. The hard-earned consensus that free trade was positive for the economy and that globalisation contained much more upside than downside is in disarray. 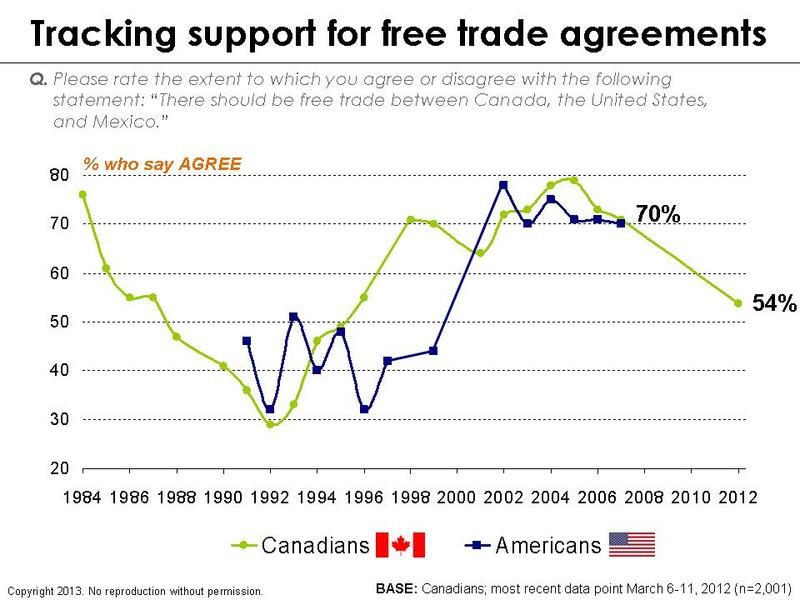 This may be a temporary aberration but the evidence over the past few years in Canada (and nearly a decade in the United States) suggests that attitudes to trade and liberalisation have cooled dramatically. By a margin of nearly three to one, we want our long-term economic trajectory to focus more domestically than internationally. This may be specious economics, but it is an unsurprising response to a period of relative decline in the global economic race, stagnation for the average consumer, and lingering fears about security issues associated with a more global economy. Unlike the immigration issue – where there are major fault lines and it appears that the positive case is more fertile in “next” Canada – the new consensus continues to form around a “domestic first” focus. So the new Phoenician Canada that seemed to be emerging at the close of the 20th century seems to have been displaced by a new ‘pull up the drawbridge’ sensibility. As one who typically celebrates the wisdom of crowds, this new adaptation to insecurity seems frankly wrong-headed. The main economic debates of our time do not appear to be about reinventing liberal capitalism for the 21st century, nor the issue of how to regenerate an optimistic middle class. There are (seemingly endless) announcements of various trade deals in the works, but little to compare to the boldness of FTA and NAFTA. There are, however, fierce debates going on about pipelines and various way to sustain and embellish our status as a so-called ‘energy superpower’. And make no mistake about it; when we hear Canada referred to as an energy superpower, it’s about good old carbon energy, particularly oil and gas. Few would deny that it is a positive thing to be endowed with rich deposits of oil and gas. Particularly in Upper North America where highways, cars and planes are king and integrally embedded in our industrial strategy (and indeed our very culture), there is little doubt that carbon based fuel will continue to be a huge staple of our economy. Deeper questions emerge when we consider this current advantage against the option of preparing the economy for an era where carbon will no longer be king. The eventual obsolescence of carbon is a matter of fierce debate but most agree that it is the principal driver of climate change and environmental degradation of the planet. Not only are there huge long term questions about the impact of carbon based economies on the very survivability of the planet, there is the more practical question of the finite nature of these products. Newer technologies such as bitumen extraction and fracking are extending the horizon but most agree these resources will eventually run out. The question of whether we should be shifting to more of a focus on post-carbon technology also becomes inextricably connected with the political economy of Canada and its traditional regional fault lines. Thomas Mulcair made controversial speculation about the relevance of Dutch Disease to Canadian oil and gas. The issue has become embedded in political fault lines and some of our most important ongoing economic debates remain focused on the relative merits of resource pipelines. So when we put the blunt question to the Canadian public of whether we should be focusing more on carbon or post-carbon for a better long term future, we are asking a very fundamental question about long term strategy. It should be noted that this question doesn’t just tap into issues of economic well-being but arguably even deeper into questions about the quality of life of future generations associated with climate change and the environment. The fault lines here are significant, but smaller than we might have guessed. Notably, we cannot find a single group in Canadian society who believes that the longer term future should be more carbon than post carbon. There are, however, notable and predictable divisions. Those regions without carbon extraction industries are much more enthusiastic post carbon supporters. It is also the case that the consensus around the need to move towards a post carbon economy is much stronger in next, younger Canada. Once again we find older, Conservative Canada relatively much more offside on this consensus about need for long term trajectory shift. Of all the areas of public opinion research, perhaps none is more frustrating or confusing than that of taxation and role of government. Results vary heavily depending on the type of tax being discussed. For example, almost half of Canadians (49 per cent) believe that they pay too much in personal income taxes. At the same time, however, a similar proportion (45 per cent) are likely to believe that corporate taxes are too low. Also, the manner in which the question is asked can easily lead to diametrically contradicting conclusions. In a previous study, we discovered that by altering the phrasing of the question, we can show everything from plurality support for more active government to plurality opposed to higher taxes. At EKOS, we have tracked attitudes towards taxation for more than a decade. In spite of the aforementioned difficulties associated with measuring public attitudes towards the role of government, our time series data allows us to gauge where the public are headed in terms of their appetite for more versus less government. Many have claimed that the recent success of the right reveals a “blueing” of Canadian attitudes. Our tracking, however, finds a growing appetite for larger (albeit more effective) government. It finds growing skepticism and fatigue with the neo-liberal mantra that less government plus lower taxes equals prosperity for all. It finds declining acceptance for the proposition that tax is a four-letter word. Views on taxes are linked to education (university graduates are more pro-tax than the less educated), and gender (women much more strongly favour social investment over tax relief than men). The largest effects are, however, based on political values and ideology. In a nutshell, support for less government and lower tax rates is much higher among conservatives in Canada. 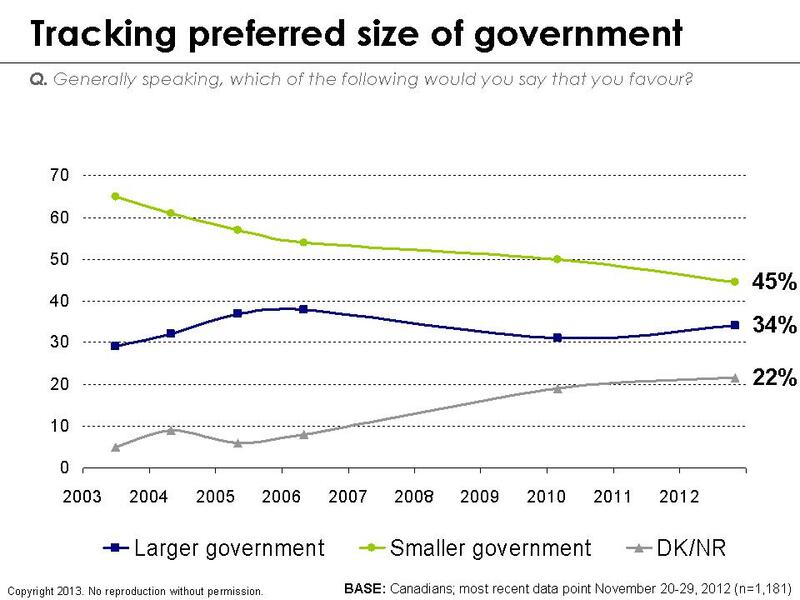 This tension across variations in attitudes to the size and role of the state and its link to tax levels is probably the largest political divide separating the roughly three in ten Canadians who support the current government from the other seven in ten. It is therefore perhaps not surprising that in our most recent poll, support for a smaller government almost perfectly reflects support for the current government. When asked whether they believe a more active government or a less active government would lead to a better future 25 years from now, just one-quarter of Canadians (26 per cent) put their faith in a smaller government (this compares to 28 per cent who say they would vote for the Conservative Party in a future election). By corollary, 70 per cent would like to see a more active government, compared to 72 per cent who would vote for another party. One notable finding, which mirrors recent European research, is that the youngest citizenry are more muted in their support for active government. The newest cohorts may be the most progressive ever in terms of social values, but they are more individualistic and less receptive to the notion that the state can solve their problems. Whether this is a product of growing up in an era of retrenchment and austerity, which offers little for them, or something deeper, it merits further investigation. Most of the linkages to the strong preference for a more active government are unsurprising. Quebec is more statist, and Alberta less so. Women are much more likely to favour an active government. But the most notable finding is that after nearly 40 years of being told that the merits of less government are the preferred recipe for shared prosperity, there is not a single group in Canadian society that does not clearly reject the path of less active government in the long term future. Whether this is a product of current pessimism about the future, or growing awareness that the big winners in the new world order (both democratic and authoritarian) all seem to have active state involvement in the economy, we can at this stage offer only broadly suggestive commentary. But perhaps it is time for us admit that monetarism and the pursuit of the night watchman state seems ready to be consigned to the dustbin of historical failure. Not to overstate the significance of these results, but we can draw the following conclusions from this exploratory exercise. First of all, the public do have some clear choices on the future trajectory and they almost entirely involve profound shifts in trajectory from the status quo. Secondly, although there are some areas of consensus, we are not all rowing together on these choices. There are some pretty acute divisions particularly across generations and across the poltical economic fault lines of our regional economy. Yet we can note that Canadians are seeking fundamental shifts in our economic and societal trajectories which at this time lean to a greener, more closed Canada with a renewed emphasis on an active state.